“The Last Empress” may be approaching its finale, but the show has done nothing but amp up the drama as it nears the end. It seems like we have more unanswered questions and loose ends than ever before! As we anxiously await next week’s episodes to find out who will survive, who will maintain power, and who will get revenge, let’s recap the six biggest cliffhangers from Episodes 43 and 44! Warning: Spoilers for Episodes 43-44 below. 1. Will Yoon wake up? 2. Will the evidence against Kang Hee come out? We also discovered that Kang Hee (Yoon So Yi) and the Empress Dowager (Shin Eun Kyung) are behind the attack on Yoon — and that in the process they stole his phone, which contained the evidence that suggested Kang Hee had something to do with Empress So Hyun’s death. Sunny and Wang Sik are searching for the missing evidence, but we’re waiting with bated breath to see whether they will be able to recover the phone and uncover the truth! 3. What is Wang Sik’s plan? This week Wang Sik (Choi Jin Hyuk) showed his good samaritan side with some kind yet mysterious actions: going around giving money to people the royal family has wronged — along with a card with his name on it. In addition to just being kindhearted, Wang Sik seems to have a larger plan in the works by getting his name out there — and we’re wondering just what he has up his sleeve. 4. What will happen to Kang Joo Seung? Right after Yoo Ra was sent to the mental hospital to try to determine whether Kang Joo Seung has any insight into Kang Hee, Kang Hee herself showed up and kidnapped Joo Seung. Interestingly, Kang Hee is trying hard to make it seem like she rescued Joo Seung, and we wonder what her motives are for attempting to win the poor man over to her side. Will he trust Kang Hee? What does she plan on doing with him? 5. Is this the end of Hyuk’s redemption arc? For weeks now, “The Last Empress” has been showing a nicer side of Emperor Lee Hyuk (Shin Sung Rok). The drama made it seem like his love for Sunny (Jang Nara) was actually inspiring him to become a better person, which also seriously confused our feelings towards Hyuk: is he a coldhearted sociopath, or the misunderstood victim of a terrible childhood? 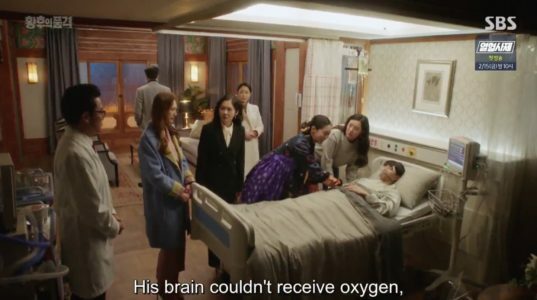 But Hyuk’s actions towards Sunny and Wang Sik this week confirmed that he is still the same twisted man that he was at the beginning of the drama. Although we expected him to be angry upon discovering that the woman he loves and the man he considers his closest friend have been betraying him all along, his brutally violent response suggests that he is no changed man. Will Hyuk be evil again for the rest of the drama? Or will he have a last-minute, permanent change of heart in the end? 6. What will Wang Sik’s fate be? After keeping his identity a secret for the entirety of the drama, Woo Bin finally admitted to Hyuk that he is Na Wang Sik, the man who has been haunting Hyuk for so long. And with dozens of guns pointed at Wang Sik, things are not looking too good for him after this revelation. Will he survive? Will he take down Hyuk and complete his revenge? We need to know! Hey Soompiers, which cliffhanger has you on the edge of your seat the most? Let us know in the comments!